Can anyone answer this...? Was on the roof of my new (to me) 37LS and I see a refrigerator vent near back of the rig but the unit comes with a residential fridge...what gives? That is the upper vent for the garage aircon. 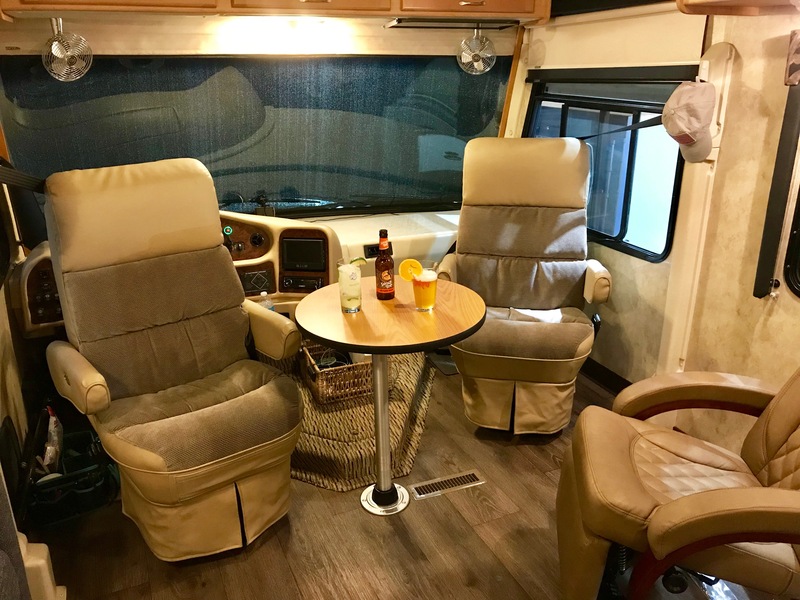 They don't use that set-up (a typical window aircon built-in to the interior cabinetry) on any other RV that I know of, so there is no standard venting made. The sidewall vent is a separate bit and together they allow the AirCon to vent to the exterior without letting rain come-in the box around the AirCon itself. Thanks....our last rig was the 29H Outlaw and it only had the side vent for the garage AC, so would never have thought of the need for 2 vents. I need to give a HUGE shout out to @JeffAZ for his post on the gas tank recall. I ordered the part from Ultra and after going in circles with a number of shops I found that Future Chevrolet here in Sacramento is a Workhorse repair and recall center. They installed the part at no charge in about 2 hours and I have no more leaking. I bet my MPG goes of significantly! Hey, your welcome Scott, that's what makes this forum so helpful. Here is another mod I just completed on my first gen OTL. The newer coaches come with this feature and it always looked like a good thing to me, so i finally installed one in my coach. I have installed a cocktail table and it is ready for service. We have beachfront reservations at Puerto Penasco MX the first of May. I think the table will get a good workout there. I acquired an ITC Sequoia 3 pedestal from Camping World and the tabletop from Amazon. The 24" diameter tabletop has dark wood on one side and light wood (matching my coach) on the opposite. I am pleased with how stable the pedestal is and the ease of deployment. I purposely mounted the pedestal on the tabletop in a slightly non-center position so it can be swiveled.